So excited that you made a pie! The way you described pie making is exactly right- you have to own it. There’s no messing around or uncertainty when you’re making pie. You just frickin’ do it. Also, I made pie crust once using a cheese grater instead of a food processor…it turned out, but um. Yeah. Not happening again. That bourbon, oatmeal crumble and divine crust — oh my gah! that looks like perfection. perfect for the fall! WOW It really looks incredible! SO amazing! You nailed it! Yay for you! This pie seriously rocks my world. Apple pie on its own is perfect…but with bourbon too? Heaven. What’s not to love. This looks delicious! I’m glad you conquered your pie-fear…cause now we get pie! and that crumble top…just stop it. Giant Eagle sells lard in Pittsburgh for sure! The Market District in Shadyside definitely does. Look for it by the Crisco and other oils and stuff. Good luck! I have a thing with asking for stuff in the store too I totally get it. I love everything about this pie, for not being a pie person you made a delicious one!! This pie is so good! I didn’t have any bourbon, so I used one cup of cider which did make it a little too runny even after sitting a few hours. Next time, I may just stick with the half cup of cider. The topping is DELICIOUS!!! Lard is actually ridiculously easy to make. Even more so if you have a slow-cooker. Go to your butcher. Yes. Butcher. Ask him for the pure white fat that is found around the kidneys/liver. Here we call it ‘speck’ but I’m not sure if that’s a South African-ism or not. Cut it up into smallish cubes, making sure there is no meat whatsoever on it. Pop it in your slow cooker on low over night. The fat will melt, leaving behind crispy crunchy bits. Strain those out and allow the hot fat to set. it should be pure white. Tada! Lard!! My personal favourite is lard made from lamb or mutton, and then used to cook crispy roast potatoes. To. Die. For. PS This pie looks amazing! As soon as we’ve move house, had the baby, and the weather cools down. I’m totally making this!! Hey there, what type of apples did you use? I normally use 3 or 4 granny smith, depending on the size and then a few other, 1 or 2 red delicious maybe throw in a Fuji. I find that the granny smith are more dense or rather harder than the others so it holds it shape and doesn’t get mushy, BUT your pictures of the apples are mouth watering. They remind me of going to my grandmothers house in North Carolina and picking apples in the mountains….sweet memories! Re: lard. I find it at my local Hispanic store. You might see if you have one in your area. Very reasonably priced. The previous commenter’s info on making your own seems really easy but in a pinch, off-the-shelf is a lifesaver. Thanks for all you do. Fall in a pie plate. I’m done. Thank you. I can’t wait to make one in my kitchen! Apple pie is actually my least favorite type of pie (I hate HATE soggy fruit. Cherry pie? Barf.) but I LOOOOOOVE me a good apple crisp. And this right here…. that last pic? Ugh. You’ve got me! Not gonna lie, I browned the heck out of that butter before adding the cider/bourbon ridiculousness. Took it right to the next level, not that it needed it to begin with. What a great pie. I will never make it any other way ever again. 10 firefighters couldn’t agree more – I had to make a second after I dropped it off (just so I could actually try some myself). Thank you thank you! Oh, my, lady! I’m definitely giving this a go this holiday season! Made this yesterday for a dinner party. Loved. It was gone instantly. I am a huge pie person, make them a lot, and this was one of the best pies I have ever had. Thank you. Love your recipes. How did I miss this? I mean it has the word bourbon in the title! My daughter thinks I like to put booze into foods too much. I wonder if she and I are even related. Anyway…or in language you will understand…anywho…or is it anyhoo? I forget but I digress. I love this. And I love pie. I have no doubt I love it because it was what my favorite Grandma made so there are so many happy memories of her and pie. But stick with it; I think there is too much pie anxiety in this world; add that to your self professed impatience and I can imagine crust making has been a royal pain. 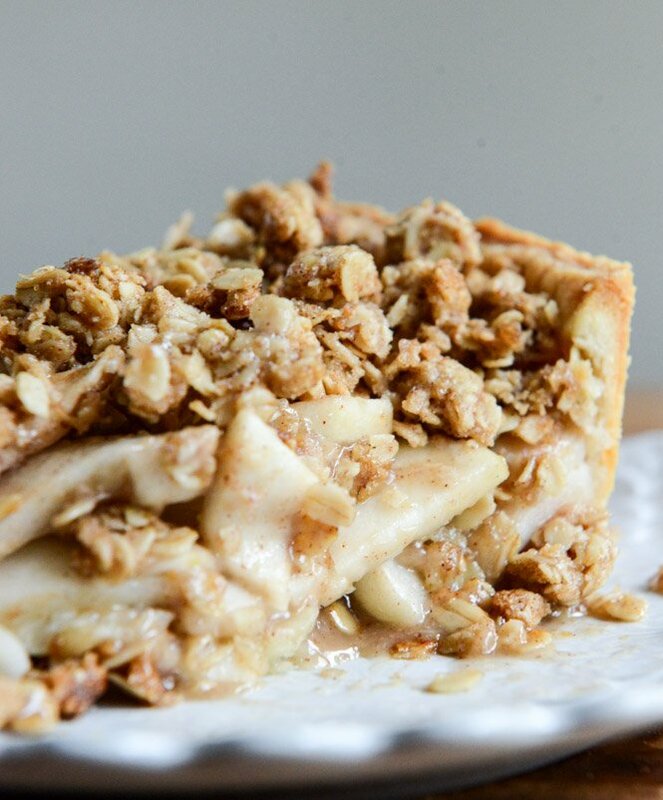 This pie is a thing of beauty…and that cider bourbon part sure helps! Is there anyway to make the crust/dough and freeze it for using it later? Could you make this pie a day ahead? If I want to serve it for thanksgiving would it work to make it on Wednesday to clear up some oven space? I have to say, I made this last weekend for a Friendsgiving and it was not good… The bourbon and cider never cooked down to a thicker consistency (I boiled then simmered for 5 – 6 minutes… then another 10… then another 15… and nothing) and tossed with the apples and baked anyway. The oatmeal crumble was divine but the apples? Like little individual shots of bourbon. It was nearly painful to eat and I’m glad I wasn’t serving it to children. I reread the recipe to make sure I did it correctly and I definitely made the pie as described. Looking forward to making this for Thanksgiving. Thank you for sharing. I made this pie for our “friendsgiving” on Saturday and just ate a piece for lunch dessert now. It is phenomenal!! Everyone raved about it but I think it gets even better as it sits?? I made this first thing this morning as a test for Thanksgiving. I am happy to say that it passed. It has a nice bourbon flavor but if you like bourbon you will like it. Thanks for adding to our holiday. I have no shame in my cooking with alcohol game, so i will ask – can you use Hard Cider here? Delicious. I had no cider or apple juice on hand so I subbed ginger beer with good results. Enjoyed it with friends last night and will have tomorrow for Thanksgiving. I made this pie for the holiday and per the other comments, I used 3/4 c. apple cider and 1/4 c. bourbon. The finished product was delicious, but I regret not following the recipe. I tasted zero zip zilch bourbon in my modified pie.